Disney's animation division had been in a slump for decades. The company's animated features began slipping shortly before Walt's death in 1966, and the decline accelerated as the "Nine Old Men," the core group of animators chiefly responsible for Disney's output from Snow White and the Seven Dwarfs (1937) through The Rescuers (1977), began to fade away. Parents weaned on Disney features themselves still took their children to each new Disney offering, but The Fox and the Hound (1981), The Black Cauldron (1985), The Great Mouse Detective (1986), and Oliver & Company (1988), while not terrible, didn't engender anything like the lifelong affection held by nearly all of Disney's classic features of the 1930s-1950s, movies that by this time were making their home video debuts, the accompanying excitement effectively overshadowing these newer releases. The studio's attempts to revitalize the form during the 1970s and '80s had generally been unsuccessful, and were it not for The Little Mermaid (1989) and Beauty and the Beast (1991) it's not unreasonable to speculate Disney might have gotten out of feature animation altogether. Produced by Howard Ashman with music by Ashman and Alan Menken, those two films took an entirely new approach to the medium: the animated feature-as-Broadway-musical. It was an approach that worked spectacularly well. Both have great songs but where the animation on The Little Mermaid isn't all that wonderful - much of it resembles an elaborate television cartoon show - Beauty and the Beast is handsome and stately, approximating the classic Disney films of the 1950s if not the '40s. Adapted from Jeanne-Marie Le Prince de Beaumont's La Belle et la Bête, with more than a few elements lifted from Jean Cocteau's 1946 live-action film, it's also much more geared to adults than any Disney animated feature before or since. It deservedly earned an Academy Award nomination as Best Picture and was a critical and commercial smash. With Beauty and the Beast poised to make a fortune on Blu-ray, Walt Disney Studios Home Entertainment has quite properly spared no expense with this title. It's fully loaded and then some. The extra features are variable, from innocuous to excellent, but the new high-def documentary about the film is top of the line. The three-disc Diamond Edition (two Blu-ray discs, one standard-def DVD) includes three different versions of the feature, all of which look and sound flawless. On the down side is the set's hopelessly confusing menus and navigation guides, one appalling and unasked for instance of interactivity, and a strained, cryptic, and emblematically Disneyesque kid-gloves approach to Howard Ashman's death from AIDS just as Beauty and the Beast was being readied for release. More on this below. 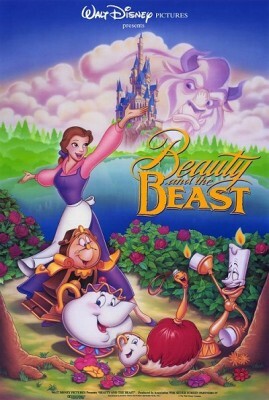 Prologue narration (by David Ogden Stiers), accompanied by stained-glass images rather than the expected animated flashback, sets up the story: a selfish young prince, having refused to shelter an old beggar woman, is cursed by the woman, in fact an enchantress, to spend his days as a monstrous Beast, while his household staff is transformed into anthropomorphic furniture and other household items. The Beast's only hope is to find a young woman who will love him even in this grotesque form before his 21st birthday, or he's doomed to remain a Beast forever. Meanwhile, bookworm Belle (voiced by Paige O'Hara) is the most beautiful young woman in her small provincial French town, and for that reason coveted by hopelessly vain Gaston (Richard White). When Belle's inventor father, Maurice (Rex Everhart) loses his way in a storm and comes upon the Beast's castle, the angry creature tosses him into the dungeon. Belle comes to her father's rescue, selflessly offering to take his place, terms the lonely Beast (Robby Benson) readily agrees to. Unhappy Belle acclimates herself to her new home with the help of the transformed servants, including Lumière (Jerry Orbach), the lusty, Chevalier-esque maître d', now a candlestick; Mrs. Potts (Angela Lansbury), the Cockney-accented cook, a teapot; fussy majordomo Cogsworth (also Stiers), a tightly-wound mantle clock. The servants conspire to help their master (and thus themselves), but he seems far too impatient and lacking in self-confidence to win Belle over in the short time left. Animated features, more than perhaps any other art form, are massively collobrative undertakings, but there's little doubt Ashman was the creative guiding source behind Little Mermaid and Beast. As the dedication found in Beast's end credits reads, Ashman "gave a mermaid her voice and a beast his soul." The Ashman-Menken scores are the most varied, clever, and most completely satisfying of any Disney feature since Mary Poppins (1964), and Ashman's grafting of Broadway-style structure and form is ingenious. The theme of redemption and its surprisingly adult romance hadn't been attempted in a Disney animated feature before, it appealed to adults while children and adults alike responded to the servant characters, the action scenes, and the songs. After several decades of Disney animated features dominated by syrupy sentimentalism, (famous) voice actor-driven performances, cuddly critters, and broad slapstick, The Little Mermaid and Beauty and the Beast were movies with refreshingly assertive heroines and with strong emotional underpinnings, especially longing and loneliness - in short, heart. My three-year-old daughter and I watched The Little Mermaid (in standard-def DVD) and Beauty and the Beast one week apart. She preferred The Little Mermaid while I prefer Beauty and the Beast. She wasn't bothered by the traumatic moments found in Pinocchio (1940), Dumbo (1941) and other Disney classics, but to my surprise found the Beast quite scary in the early scenes. I always felt they made him a bit too cuddly; the extra features show off many alternate, rejected designs - personally, I wish they had gone with the scarier mandrill-faced Beast. Reportedly, Beast cost a whopping $15 million less to produce than The Little Mermaid though this hardly seems possible. Besides the cheaper looking animation of Mermaid, Beast was in development for six months before the decision was made to scrap everything and start over, a costly if worthwhile decision. That the film turned out as well as it did is nothing short of miraculous: one of those rare movies-by-disparately-staffed-committee that actually resulted in a terrific film (The Wizard of Oz and Casablanca being two other successful examples). Beauty and the Beast - Diamond Edition is a three-disc set packed to the gills. Getting around these discs ain't easy: Disc 1, the DVD, has three cuts of the movie plus some extras; Disc 2, the first of the two Blu-ray discs, also has three cuts of the movie plus some extras; and Disc 3, the second Blu-ray disc, has additional supplements, mainly two not very good games balanced by an excellent making-of documentary. A navigational overview insert confusingly rolls the content of both Blu-ray discs into one, as if it were a single disc, while onscreen an animated Lumière (voiced by someone imitating Jerry Orbach imitating Chevalier), in attempting to guide viewers through the mayhem, never shuts up. Further confusing things are prompts steering viewers toward "Recommended Features" and away from others. If it's not recommended, why include it at all? And, as usual, viewers must wade through a veritable sea of Disney commercials to get to the heart of the program. The interactivity of these discs works well most of the time (see below) but I was quite shocked when a pop-up menu appeared just as Beauty and the Beast concluded and the end titles began: without warning, one of those "Recommended Feature" prompts intruded upon my enjoyment of the film, like a waiter pushing the dessert tray at me while I'm still enjoying my steak. Complaints aside, the movie looks spectacular, far better certainly than the barely adequate 35mm print I remember catching in 1991. Filmed for 1.85:1 cropping, the 1080p, 1.78:1 image (oddly, there's a "this film has been modified to fit your TV" disclaimer on the packaging) is free of dirt and other damage, and the vivid colors pop off the screen. A 3-D release and eventual Blu-ray 3D version are supposedly waiting in the wings but I could care less; this is the version of the film I want to see. Three cuts are available：the 1991 original theatrical release version, a "special extended edition" that adds six minutes of footage, mostly to accommodate an enjoyable but expendable number, "Human Again," and the original storyboard version run in tandem with the film via picture-in-picture (PIP). Menus and subtitles are offered in English, French, and Spanish with audio in those languages. English is 7.1 DTS-HD Master Audio, with the latter in 5.1 DEHT. Audio is enormously robust, appropriately coming close to a live theater experience. The Blu-ray discs are region-free. Scads, and most of it in high-def. The centerpiece is a feature-length behind-the-scenes documentary, "Beyond Beauty," which is as exhaustive as any I've seen devoted to a single motion picture. Nearly all the key surviving creative personnel are interviewed and there's lots of useful footage. The documentary is pretty forthright by Disney standards, acknowledging a lot of the studio politics (including kicking the animation division off the lot and into a comparatively dilapidated warehouse in Glendale) and conflicts during the story's development period. It's less so about Ashman. The documentary comes with an option to view extended annotations and these are as good and interesting as the main documentary. Also extremely good is "Composing a Classic," a conversation with Alan Menken about his collaboration with Ashman and which really gets down to the nuts and bolts of songwriting. I found it particularly fascinating. Conversely, "Broadway Beginnings," about the musical stage version of Beauty and the Beast, struck me as utterly pointless. Mostly a talking heads piece about how neat it is to act in front of people, it seems geared for the glee/High School Musical crowd and is mainly an extended advertisement for schools and local theaters to license the show. An audio commentary track with co-producer Don Hahn and co-directors Kirk Wise and Gary Trousdale is especially good and very informative much like the documentary. Nearly a half-hour of deleted scenes, including an entirely different (and quite terrible) opening, is also included. Of considerably less interest is a new music video (in HD) featuring Jordin Sparks's cover of "Beauty and the Beast"; two games that take far more effort than either is worth - "Bonjour - Who Is This?" and "Enchanted Musical Challenge," Disney FastPlay, Sing-Along tracks, and BD-Live functions. Talk about your bells and whistles. While Disney's renaissance continued through the late-1990s, including even bigger box-office successes with Aladdin (1991) and The Lion King (1994), Beauty and the Beast is far and away the creative high point of this era. Disney Home Entertainment's Blu-ray, while really overloaded and a bit too aggressively interactive, presents the film in a form arguably finer than its original theatrical release. A DVD Talk Collector Series title.